1. Laura Mercier Ambre Vanille - In the summer I was wearing this one from Laura Mercier, but this Ambre Vanille is exactly what fall should smell like. I love vanilla based fragrances, but they can either be warm and inviting or sickeningly sweet. Thankfully, this one falls in the former category mixing notes of amber and vanilla with tangerine, coconut, almond and sandalwood. The sweetness is balanced nicely with a touch of citrus and woodsy notes. I have always been a fan of Laura Mercier's makeup line, but her fragrances never made it onto my radar. Welp, that won't ever be the case again - these are too good to overlook! 2. Maison Francis Kurkdjian Feminin Pluriel - I am already a HUGE fan of Maison Francis Kurkdjian's delicate floral scent A la Rose and have recently been wearing Aqua Vitae Forte which is crisp and fresh, so it was nice to try something from the opposite end of the spectrum. While the Feminin Pluriel still has strong notes of iris, violet and jasmine, the vetiver and patchouli create a much deeper finish to this bold floral. A little goes a long way, so I only need one spray to last me all day long. 3. Jimmy Choo Illicit - I was having a spa date with a friend that works in PR and she gave me a bag of goodies to try from brands that she represents as I was leaving. Now let me be perfectly honest, I get very nervous when brands, publicists or even friends give me fragrances without me having any knowledge of what they smell like. 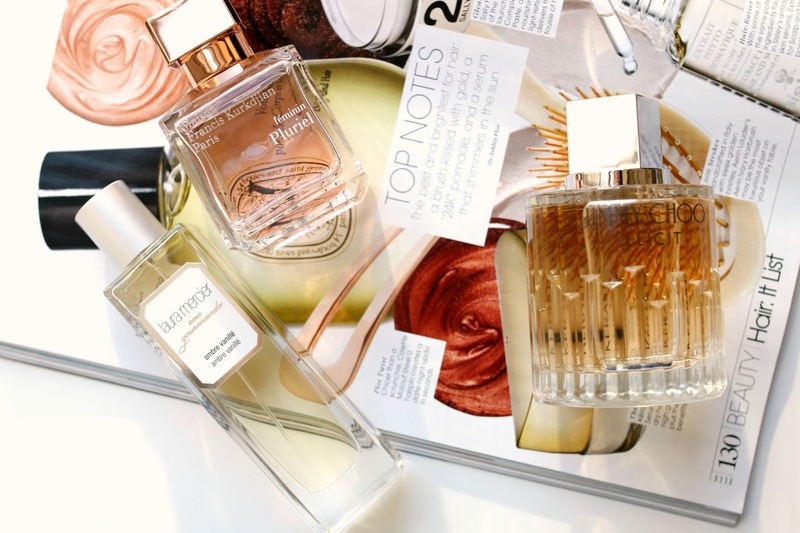 I am VERY fussy when it comes to fragrance and sadly I have been in situations where I try something at an event or from a friend and am politely trying not to gag because I hate it so much. I pulled this out of the bag, crossed my fingers in my head and hoped I would like it. (Now of course she would understand if I didn't - but I always hate having to be the bearer of bad news LOL) I put the bottle up to my nose and immediately remarked "I LOVE THIS!" and meant it. Ha! In fact, I wore it every day for a week straight after receiving it and it's still on rotation at least once a week. It's a spicy oriental with notes of ginger, rose, jasmine and honey-amber. While it ultimately feels like a fall/winter fragrance to me, it is light enough to wear in the spring/summer. Highly recommend giving this a try for a new fall scent!